Everyone is more productive these days. This has been a consistent trend for at least the past decade, where productivity gains have been particularly strong within the business sector. According to data from the U.S. Bureau of Labor Statistics, today’s business industry workers are on average 30% more productive than their 1998 counterparts (productivity growth of roughly 2.6% per year). 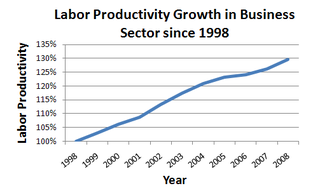 Within the technology industry, productivity has increased more. Thanks to smartphones, improved search engines, better CRM software, and ever-increasing bandwidth, salesmen and marketers can find, receive and process information faster than ever. The most dramatic gains, however, have occurred within software development. The advent of open source software makes engineers particularly efficient. One VP Engineering that I talked to gave me an anecdote about one module where they used open source files with about 500,000 lines of code and then wrote 7,000 lines of code to stitch it all together. Open source software is also free. In the company I was running in 1999, “software” was a huge budget line item – we had to buy databases, testing suites, libraries, and more. Today all that stuff is free … a start-up might spend more money on sodas for the office than it does on software. We’re all familiar with Moore’s Law – that the power of computers doubles every 18 months. In my 15 years of software development, I’ve seen 5x-10x productivity gains in engineers. Which could mean that the productivity of a well-trained engineer doubles every five years. (note that this Law is much harder to prove than Moore’s Law – but potentially just as profound). That would mean that the productivity of an engineer is growing at roughly 14.9% per year! That’s fast … really fast … much faster than the 2.6% yearly gains the population as a whole is making. This means that today’s companies are able to do more software engineering and build more stuff with fewer people. But should they do more with less? It could be much more prudent for a company, especially for a small company, to do the opposite … and to double-down on engineering. You can use the productivity gains in software development as a strategic advantage and invest aggressively in engineers. First, doing so contributes the most to progress and also increases the chance for breakthroughs in innovation. Second, engineers – as opposed to salesmen and marketers – can often hit the ground running (assuming you have a good on-boarding system) and have a positive impact within a few weeks. Alternatively, many large traditional companies might be able to get by with FEWER but DIFFERENT engineers. These companies might need to change their approach to engineering to take advantage of the new tools. The companies that can benefit from fewer engineers are likely ones that haven’t changed their technology platforms radically in the last ten years. 1. Off-shoring. Because of new technology and higher bandwidth, more companies are off-shoring their software development. But this does not fully explain the flat salary phenomenon since firms are also off-shoring sales and marketing (though to a lesser degree). 2. Need for software engineers has decreased. Because software engineers are so much more productive than they were ten years ago, many firms are opting to hire fewer of them. If a company is not doing hard-core engineering, it actually needs fewer engineers as a portion of its total workforce than it did ten years ago. (I personally think this could be a big mistake … but I will get to that later). Both the off-shoring and the decreased need for engineers has led to a lowering of the demand which has likely put a check on wages. One problem, of course, is that measuring “output” of an engineer is a really hard thing to do (as opposed to the output of a salesperson) … so it is really hard to quantify the productivity gains. And even if you can measure output in engineering, it is sometimes hard to tie that to an increase in profitability. And, like sales, the quality of engineers varies wildly. A great engineer is potentially 2-4 times more productive than a good engineer. Ben Ling from Google pointed out to me that some great engineers are massively compensated – because they tend to be the early hires at a company and get lots of stock (most of Google’s first 50 employees were engineers). Let’s recap: The productivity of a software engineer has increased 2-3 times that of a marketing person in the last ten years. Yet their relative compensation has remained about the same. That means if you are a savvy company, you should stock up on engineers. In fact, you would want as many great engineers as you can get a hold of. This engineering productivity boom will only increase and continue to create dislocation and creative destruction. While the extent of growth and industry makeover are hard to gauge, what is certain is that corporations relying on technology and engineering paradigms from the 1990s or before will find themselves hard-pressed to compete with the new and nimble movers. (special thanks to Jonathan Hoffman, Michael Hsu, Ben Ling, Jeremy Lizt, Naghi Prasad, and Dave Selinger for their feedback and edits). 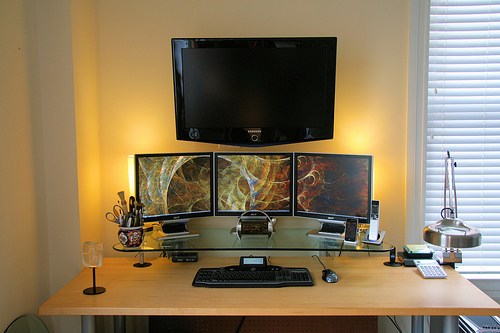 This entry was posted in Business_Ideas, Web/Tech on June 11, 2009 by auren. There are a bunch of background check services but very few that encourage you to background check yourself. And even fewer that give a potential employer the opportunity to access your verified information. There should be a business that allows consumers to pay for a resume verification service (verifying that you did get an MBA from Stanford, a computer science degree from Georgia Tech, worked for Goldman Sachs, etc.). Then the consumer can put a unique URL on the bottom of his resume that takes potential employers to a trusted page, with a trusted brand, that lists which of the items on someone’s resume the service was able to verify. It is that simple. Of course, the economics only comes with building large-scale relationships with employers and universities as I doubt you could charge more than $100/person (plus $20/year to maintain the record). This entry was posted in Business_Ideas on October 30, 2006 by auren. Another business idea you are free to steal … paying famous people for their time. Let’s say you want to talk to P-Diddy, Bill Clinton, or Warren Buffett. Pay them for their time. I’d like to see a business with a directory of famous people who all have a rate per hour that they have specified (kind of like what Ether does with knowledge professionals). Then, through the site, you can schedule a time to talk to your favorite person by phone. Would it be worth it for you to pay $1000 for 30 minutes of Sean Connery’s time? Maybe. Maybe you have something to pitch him … or maybe you just want to ask him an question about what it was like to be James Bond. And it could be an interesting academic, a great researcher, or someone you want to talk to about roofing. Regardless, for the famous person it could be fun, easy to schedule (could do it while in the car or at a convenient time for them), and could be a good side source of income (and the target could decide to donate all or part of it to charity). This entry was posted in Business_Ideas on October 10, 2006 by auren. I know a lot of people who want to be an entrepreneur, want to open their own business, but their not sure if they are right for it. They’ve been at a large company or have been in government. My past advice: do it. But I have been thinking about it more and realized entrepreneurship is not for everyone. It is for a lot of people and maybe even most people, but not for everyone. Yes … practice being an entrepreneur. Before having kids (which are a lot of responsibility), many couples first might try getting a plant. Then seeing how they handle the watering responsibility. Then they might get some fish. And then a dog. And then, after they get a hang of it, they might chime in with some kids. That same concept could apply to being an entrepreneur. Maybe you’re in school — start a small student club. If that goes well, start a student movement. Or you’re working full-time … so start a blog or some small web site. See how it goes. See if you like the responsibility of constantly adding to it and marketing it. Then maybe put advertising on it. It is a good idea to try to walk before you run. For many people, you might want to practice being an entrepreneur by doing something small yet tangible before jumping into it. This entry was posted in Business_Ideas on September 24, 2006 by auren. In theme of putting up crazy business ideas … here’s one … Let’s create a new cigarette brand. And instead of a cowboy or a hot model or a crazy cartoon camel, this cigarette mascot will be a skull and cross bones. Yes, stay away. It is Death. Would this sell? Not sure. But my guess is that there is a large enough audience of smokers out there who are tired of big tobacco lying to them and pushing cigarettes on kids. Death would be just the opposite. We’d be very up front with our customers — we will probably kill you and we don’t think you should buy our product. “Death” might encourage people not to take up smoking or to quit. Truth in advertising might actually work. This entry was posted in Business_Ideas on September 19, 2006 by auren. OK … i was inspired by my friend Noah Kagan who often blogs free business ideas. HehGoodLooking.com is like HotOrNot meets DIGG: for places like match.com, Jdate, MySpace, friendster, etc. – a user is surfing MySpace, friendster, match.com, JDate, etc. and the user wants to rate the good-looking-ness of the profile they are viewing. – then the user rates the person’s hot-ness from 1 to 10.
and, of course, other people can go to HehGoodLooking.com and just go through the pictures (like HotOrNot). this would be really fun. of course, the pitfalls wil be copyright issues. but there is likely to be a way around this (like an iframe or partnership or luck or something). This entry was posted in Business_Ideas on September 5, 2006 by auren.